Gum disease is very common and manifests itself as a simple inflammation of the gums to severe painful swelling of gums with pus formation and loose teeth. Gum disease can progresses to the bone resulting in bone loss and tooth mobility leading to a condition called periodontitis. Gum disease can be prevented by regular checkups and professional teeth cleaning procedures. Patients may have a few or all the signs mentioned above. If you notice this, schedule an appointment for treatment of gum disease at Aspen Dental Care immediately. 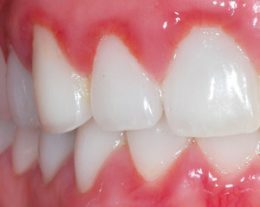 Teeth scaling: Deposits called plaque and calculus get deposited on the teeth over a period of time. These deposits are crystalline in form and have a high content of bacteria. These deposits may extend from the outer surface of the teeth to the bone beneath the gums. It cannot be removed by brushing. Regular professional teeth scaling done every 6 months removes these deposits and helps prevent bad breath and maintain healthy gums. Deep scaling will be required in extensive cases which may be done under local anesthesia. Root Planing: When the deposits extend beneath the gums and onto the tooth root, the gums may be reflected to expose the root surface. The root surface of the tooth is then cleaned using special instruments. The gums are then sutured back into position. 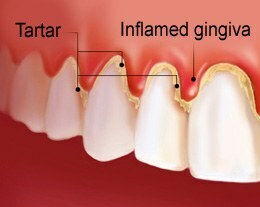 Curettage: Disease of gums may lead to necrosis of the gum and attachment fibers between the teeth, gum and bone. These necrotized tissues are removed surgically by reflecting the gums. Instruments known as curettes are used for this purpose. Curettage stops bone loss and helps the gums to adapt firmly back to the tooth and bone. Lasers may also be used to perform curettage. There is almost no bleeding and minimal postoperative pain with laser treatment. 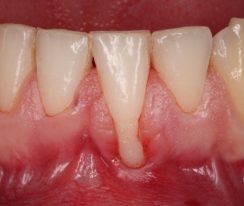 Flap surgeries: When there is bone loss and the gums move done along the length of the root, it is called gingival recession. This causes not only cosmetic issues but also loose teeth. In flap surgeries, the flats of gums are reflected to expose the diseased surface, cleaned and the flaps are re-positioned in such a way so as to cover the exposed parts of the tooth root. Flap surgeries may also involve procedures where bone and other tissue grafts are used to cover areas of recession. Fibroma removal: Certain medical conditions may lead to the formations of unsightly lumps called fibromas. These fibromas are usually benign. But it is recommended that it be removed after biopsy and histopathological analysis. Pericoronitis treatment: When the third molar is impacted below the level of the adjacent tooth, food gets lodged in the pocket of the tissue covering the third molar. This results in the tissue becoming inflamed and painful. The usual treatment requires the impacted third molar to be removed. But in cases where extraction is not possible, the tissue is surgically removed (operculectomy) to prevent further food lodgement in the gap. This is not a permanent treatment because the tissue usually grows back to its original form. Prevention of gum disease starts with good oral hygiene maintenance. The problems of gum disease is that you may not know about it until its advanced stage. Regular dental check ups will help identify gum disease at its earliest stage. Gum disease can affect anyone at any age. If left untreated, it can become a very serious issue. At Aspen Dental Care, our general checkup includes a periodontal assessment. This lets us know the condition of your gums and underlying bone. Our periodontist will suggest the exact treatment required to help you maintain a healthy smile for a long time.